Duolok® tube fittings use a two-ferrule design to ensure leak-tight performance in analytical and process instrumentation applications where leak-tight performance can have a significant impact on quality, productivity and cost. They are designed and manufactured to interchange and intermix with Swagelok® tube fittings. Fractional Sizes: 1/16 to 2 in. Adapters: NPT, ISO/BSP, SAE/MS, AN, weld, tube stub, port connectors, hose, and ORFS. Special fittings: Bulkhead and extended (long), bored through, positionable, calibration and dielectric fittings. Accessories: Stop collars, bulkhead locks, nut and ferrule sets, tools and accessories. *Duolok tube fittings are rated to the maximum allowable pressure rating of the tubing it connects. Duolok tube fittings consist of four precision-machined components: body, front ferrule, back ferrule, and nut. During make-up, the double-ferrule design, with the staged sequential swaging action of the ferrules, compensates for the variation in tubing materials, hardness, and thickness of the tube wall to provide leak-tight connections in an extensive range of applications. 316 stainless steel fittings are manufactured from cold-finished bar stock in accordance with ASTM A-276 and ASTM A-479. Elbows, tees and crosses, are machined from close-grained 316 stainless steel forgings in accordance with ASTM A-182. All components are heat code traceable with certified material test reports (CMTRs) available on request. More information about other materials. Duolok tube fittings are completely assembled and individually bagged to assure the highest levels of quality and cleanliness. The protective bags eliminate contamination (tubing burrs, dirt, etc.). They are packaged in convenient, small-lot quantities for easy procurement and handling. Box labels are color-coded according to the tube fittings' material. Labels include the part number, material, product description and picture of the product. NPT thread and BSP tapered thread fittings are availabe with factory installed high-quality teflon tape. 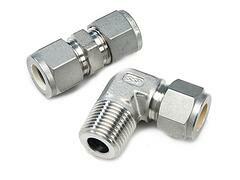 Factory-taped fittings reduce costs and ensures that threads are properly taped for more leak-tight installations. Duolok tube fittings are manufactured in accordance with SSP's Quality System, which has been certified to conform to the ISO 9001:2000 Quality Standard. In addition, all fittings are manufactured to the technical design specifications and rigid quality control standards of the SSP Instrumentation Division. SSP's continuing commitment to quality is reflected throughout the company in its personnel, policies, equipment, products and service. SSP offers tools and accessories to support tube fitting assembly and installation and tube cutting, preparations and bending.